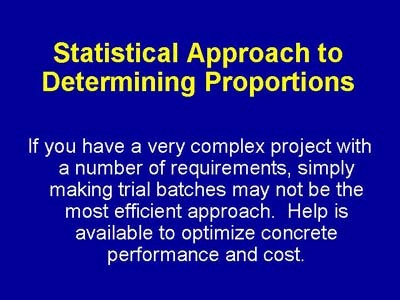 Attempting to optimize a concrete mixture with many requirements may require many trial in the laboratory. Without an organized approach, you can't be sure that you have optimized both performance and cost. Luciano, J. J., and Bobrowski, G. S., "Using Statistical Methods to Optimize High- Strength Concrete Performance," Cement, Admixtures, and Concrete, Transportation Research Record 1284, 1990, pp. 60-69.